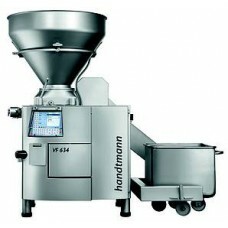 The Handtmann VF 634 is especially suitable for industrial spreadable sausage production. Its large vane cell feed system and hopper with 350-litre content ensure high production output, especially in combination with high-power clipping machines. VF 634 with monitor control, for example for AL connection, with 10“ colour display and Windows-CE control interface. Outstanding evacuation for first-class product quality. Synchronisation of feeding speed and feed mechanism ensures high filling capacity. Outstanding product quality through optimum filling of vane cells. Patented built-in weight compensation provides pressure and volume compensation in vane cells for very high portioning accuracy. Excellent synchronisation of servo and control technology. The Handtmann VF 628 is a strong partner for industrial companies with very high requirements. The i.. The Handtmann VF 620 vacuum filler is the all-in-one Generation 600 industrial filler. Its precise p..
Re-engineered Handtmann VF 630:Serial no. 21217Year: 2006..
Re-engineered Handtmann VF 630:Serial no. 19705Year: 2005..
Re-engineered Handtmann VF 608:Serial no. 30112Year: 2012..
Re-engineered Handtmann VF 610:Serial no. 30314Year: 2012..
Re-engineered Handtmann VF 628:Serial no. 20338Year: 2005..
Re-engineered Handtmann VF 628:Serial no. 26580Year: 2009..
Re-engineered Handtmann VF 628:Serial no. 25871Year: 2009..
Re-engineered Handtmann VF 628:Serial no. 19582Year: 2006..
Re-engineered Handtmann VF 630:Serial no. 16804Year: 2003..
Re-engineered Handtmann VF 630:Serial no. 15526Year: 2002Product infromation leaflet..
Re-engineered Handtmann VF 630:Serial no. 12802Year: 2001..